I don't know how but Gemsigns had escaped my attention. Reading some positive posts about Gemsigns really got my fired up about it. Like I have mentioned in some other reviews, genetic tinkering IS for me one of the most alluring subjects to read about. With the current technology making leaps in all what is possible, the day that it may go wrong might actually be closer than we think... But it's also a difficult subject to use into your book, as there are a lot of technologies and knowledge that come looking around the corner. What I could make up from the synopsis was that it would be such a kind of story, however just a few chapters is I found that the tone of the book was steering towards a different direction. Yes there is a focus on how it was all made possible but more importantly Stephanie Saulter tackles higher subjects: acceptance, diversity and humanity. I wasn't expecting this and it completely transformed Gemsigns for me, this is a outstanding read. Maybe I should first being with the concept that Stephanie Saulter introduces in Gemsigns the gems and the norms, though you are confronted by this earlier on, what and how it all came to pass remains obscure until you are a few pages in. Gemsigns takes place on Earth but not as we no it. The current age is 131AS (I hope I am correct if I say this stands for After Syndrome) and a sort of incurable by standard medicines, a terminal disease, brought on by ourselves by being constantly connected to computers and the media. This decimated the population and the only way to save it was by genetic engineering. But it didn't stop there... as the world had collapsed and humans had to be tailor made to suite specific task of working, this resulted in the gems, the workhorses of society. The gems were made by several big companies known as the gemtechs but now that the gems have been given freedom, the gemtechs are losing their monopoly position and they want it back. desperately. Gemsigns starts off very interesting producing a sort of birds eye view with mentioning "So our story begins" and you are already introduced to several character that you know will play an important part in the rest of the story. Several important players in the story are Eli, Gaela, Aryel, Zavcka and Gabriel, there are plenty more that you get to know along the way both from the norms and the gems and of course lets not forget the godgangs.The main protagonist of Gemsigns has to be Eli Walker. Eli is a scientist, but not the labtech engineering type but an anthropologist, tasked with making a proposal whether the norms and the gems are the same. The story mainly revolves around Eli carrying out his investigation in the lives of gems and norms, but if everything would have been just so straight forward, it might have been easy. But it's not. Eli is thrown down a spiral and confronted by people from both sides, Aryel for the gems and Zavcka for the norms. You really see how Eli is struggling with all that is being said to him, but I really liked how he went about and tackled this all. Eli digests all the information he is given as you would expect of an scientist, weighing the pro's and cons against each other and relate it all on the bigger picture. By this you do get to not glimpse but completely see the different standpoints of the gems and the norms. From the gem perspective there are several characters that you follow but the most important ones were Gaela and Aryel and perhaps Gabriel. Gaela, who has the power to to view across different wavelengts from UV to infrared, can be viewed as a freedom fighter. Her adopted son Gabriel is quite an enigma among the gems. A lot of the second half of the story set certain things straight about Gabriel and gives Gaela's character quite a determined and protecting personality. It's not that Gaela is considered to be a terrorist but she does want to have equal rights and treatment. Aryel is the leader of the gems, and her body is shrouded in a impenetrable cloak and she has a hump. Stephanie Saulter really manages to create a sort of alluring sense around Aryel's by all that she says and leaving her history to be guessed. In the end all is revealed what is hidden beneath her cloak and it did inspire me to think about if this had any secondary meanings. All in all as you see the gem society, it like one big caring family that has to fend for themselves, they do get support but that does not always turn out for the better, and by this it is letting me belief if the word "gem", short for the genetic modified humans, might not have a different meaning as well. It feels like the gems are the ones that show what humanity is about. On the norm side you have again several perspectives. But the focus is really on Zavcka. And what you might expect from someone representing one of the big companies is deceit and forcing your ways onto one another and this is kind of reminiscent to Zavcka's character, she like to be in control of everything and wants to have it all done in her way. By her you really get to see the bureaucratic side of it all and what other plans they had with the gems, adding a layer of thriller onto the science fiction. This even more comes to show when the whole scene between the norms and the gems starts to escalate and the godgangs come into the mix. The story of Gemsigns feels like it is plotted down to the details. Like I mentioned above, you are first readily introduced to the characters, gems and norm and other terms that are being used throughout the book and just later you learn by several articles what it all entails. Some people might be put off by not knowing this stuff before hand, but I found exposing the storyline in this way to be great. It leaves you with a lot of questions about everything and which you will be able to relate with the articles, finding either confirmation or rejection of your thoughts. But they also proved valuable insights in relating to several characters and events that let several things fall into place. Stephanie Saulter really knows how to set up an engaging storyline. Gemsigns is an incredible debut and Stephanie Saulter will be an author to watch out for in the future. If she has managed to create such an unique and fresh story as her debut, I want to know what more she will be able to turn out. Gemsigns has a unique idea behind it, it'part science fiction, part thriller and full of ethical exploration. 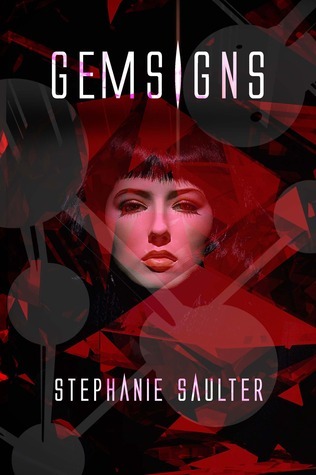 I hadn't expected to be pulled into Gemsigns in the way that it was one, from the first page Stephanie Saulter really hit the right snares to create a interesting and engaging storyline. Instead of lying heavy on technology, Stephanie Saulter focuses more on the human, ethical and societal aspects that accompany the gems and the norms and explores them in detail. Her characters are crystal clear and the way that her story was executed makes them fully come together. Gemsigns is one of the must reads of this year. The second book in the Revolution series Binary is out Arpil 3rd 2014, still some time away, but this time it is noted and I won't let it pass me by a second time!